Description: A stand of Tall Pines accent this nature inspired flushmount. 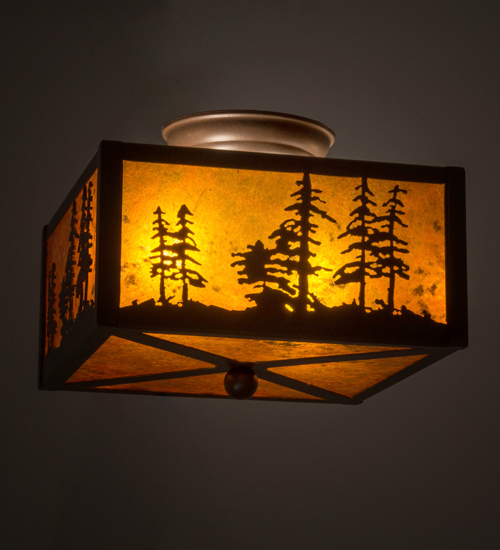 The rustic ceiling fixture is finished in Cafe Noir and has Amber mica panels. Handcrafted by highly skilled artisans in our 180,000 square foot manufacturing facility in Yorkville, New York at the foothills of New York's Adirondack Mountains. Custom colors, sizes, and styles are available. Dimmable energy efficient options such as LED are offered. The 28-inch wide fixture is UL and cUL listed for damp and dry locations.